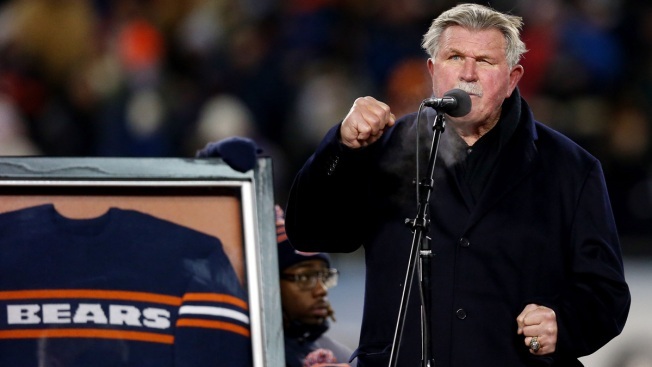 It was Mike Ditka's day in Illinois -- and his night at Soldier Field. Gov. Pat Quinn's office said Monday that he's declared it "Mike Ditka Day" in honor of the former Chicago Bears player and Super Bowl-winning coach whose jersey was retired. The Hall of Fame tight end's No. 89 was retired during a halftime ceremony Monday night when the Bears hosted the Dallas Cowboys. The Bears showed highlights of his playing and coaching career and rolled out the red carpet at midfield before he walked out to a thunderous ovation. There were more video tributes from players, and chairman George McCaskey told the crowd the honor was "a long time coming." With the 1963 championship and Lombardi trophies along with a Hall of Fame bust alongside him, Ditka said he's "been living a dream for 74 years." Ditka was the 14th Bear to have his number retired by the team. "You don't play the game or coach this game with this in mind," Ditka told reporters afterward. "It's the icing on the cake, the final candle, whatever you want to call it. It's been a hell of a run." At an event earlier in the day, chairman George McCaskey called Ditka "the most iconic Bear alive." "He's the Coach," McCaskey said. "Great career as a player, and while this doesn't go directly to retiring a jersey, you can't ignore the fact that he was the coach of the Super Bowl Bears." The 1985 team is widely considered one of the greatest in NFL history. With Hall of Famers such as Walter Payton, Dan Hampton and Richard Dent along with larger-than-life characters such as Jim McMahon, Steve McMichael and William "The Refrigerator" Perry, the Bears plowed their way to a 15-1 record and ran over New England in the Super Bowl. The biggest character of all might have been their fiery coach, who clashed with McMahon and Buddy Ryan and remains an icon in the city more than two decades after he was fired by the franchise. "Blue collar, hard worker," said Otis Wilson, an outside linebacker on the championship team. "He's like a guy who goes to work with his lunch pail. You're going to get everything out of him, and he's gonna do it his way, and he's gonna say 'Stay the hell out of my way. Let me do what I do best.' That's Mike Ditka. "Chicago is synonymous with that — hard work and guys who don't mess around. When you came to Chicago, you know you had to play a football game. That's what he told us, and that's what we were. Even today, people come up to me and act like the (1985) Super Bowl was just yesterday. It's synonymous with Chicago, and he's that face of the Chicago Bears." In a statement, Quinn called Ditka "the best tight end of all time." And he said "Da Coach" ''molded and guided arguably the best football team," referring to the 1985 Super Bowl champs. Ditka was drafted by the Bears in 1961 and played for the team through 1966. He returned to coach from 1982 until 1992.